A lively conversation with sports attorney and former Washington Senator’s broadcaster Philip Hochberg; Documentary Filmmaker Aviva Kempner (The Life and Times of Hank Greenberg and an upcoming film about Moe Berg); and author Frederic J. Frommer (You Gotta Have Heart: A History of Washington Baseball from 1859 to the 2012 National League East Champions) about the eclectic and memorable stories of Washington DC’s Jewish players. 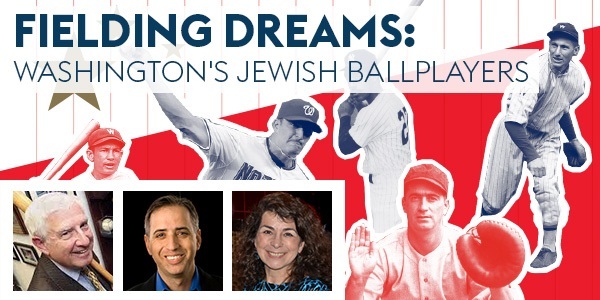 Notable names include Moe Berg (catcher, scholar, spy); Elliott Maddox (the only Black Jew to play in the Major Leagues); and Jason Marquis (the first observant Jew to play for the Nats). Supported by The Chaim Kempner Collection Library Fund. The Chaim Kempner Author Series brings authors of recently published books to the EDCJCC for the learning and enjoyment of the entire community. In partnership with the Jewish Historical Society of Greater Washington.